Giphyomatic Automatic Post Generator Plugin for WordPress is a breaking edge (made in 2017) Giphy To WordPress post importer plugin that is ideal for auto blogging and automatic Giphy image publishing to your blog . It uses Giphy public content to turn your website into a auto blogging or even a money making machine! Using this plugin, you can automatically generate posts based on a set of predefined rules. These rules can generate posts from. - Text Spinner support ЁC automatically modify generated text, changing words with their synonyms ЁC great SEO value! - Ў®Keyword Replacer Tool' ЁC It's purpose is to define keywords that are substituted automatically with your affiliate links, anywhere they appear in the content of your site. For example, you can define a keyword Ў®codecanyon' and have it substituted by a link to http://www.codecanyon.net/?ref=user_name anywhere it appears in your site's content. - You can test the plugin's functionality using the Ў® Test Site Generator '. 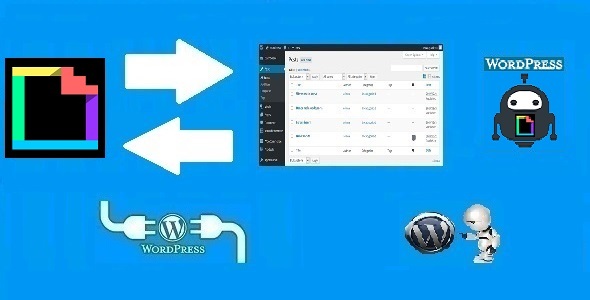 Here you can try the plugin's full functionality. Note that the generated testing blog will be deleted automatically after 24 hours. If you already bought this and you have tried it out, please contact me in the item's comment section and give me feedback, so I can make it a better WordPress plugin! Through this plugin you are able to grab content from Giphy that does not necessary belong to you or which are not under your control. Images and media uploaded to Giphy belong to the author that created the image or media. If you grab copyrighted material without the author's permission, the plugin's developer does not assume any responsibility for your actions. Also, the plugin's developer has no control over the nature, content and availability of grabbed material. Check out this MEGA plugin bundle or this SOCIAL plugin bundle . OKomatic Automatic Post Generator and Odnoklassniki Auto Poster Plugin for WordPress; Imguromatic Automatic Post Generator and Imgur Auto Poster Plugin for WordPress; Wpcomomatic WordPress.com To WordPress Automatic Cross-Poster Plugin for WordPress; Mediumomatic Automatic Post Generator and Medium Auto Poster Plugin for WordPress; Ebayomatic - Ebay Affiliate Automatic Post Generator WordPress Plugin; Movieomatic Automatic Post Generator Plugin for WordPress; CJomatic - Commission Junction Affiliate Money Generator Plugin for WordPress. Keywords: auto poster, autoblog, automatic giphy, gif image, gif post, giphy, giphy album, giphy content, giphy feed, giphy gif, giphy photo, giphy post, giphy poster, money generator, post generator. Premium CodeCanyon Giphyomatic Automatic Post Generator Plugin for WordPress 20889734 WordPress Themes, Website Templates, Mobile Themes, Flash Templates & Scripts from creative professional designers. Full details of CodeCanyon Giphyomatic Automatic Post Generator Plugin for WordPress 20889734 for digital design and education. CodeCanyon Giphyomatic Automatic Post Generator Plugin for WordPress 20889734 desigen style information or anything related.